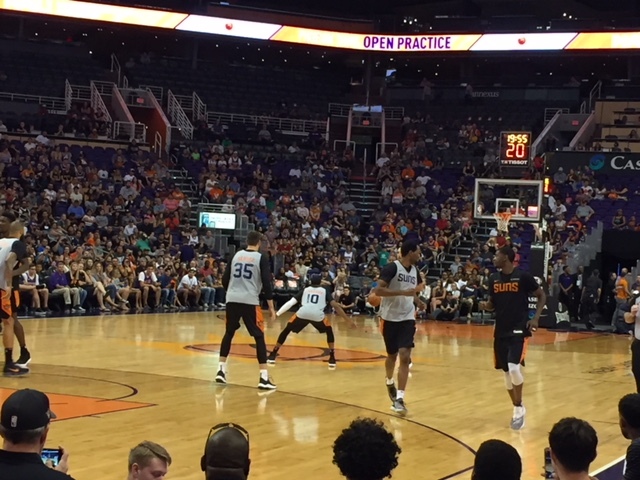 I took my 5-year-old son to the Phoenix Suns open practice on Saturday, the first time that I can recall having ever attended such a thing here in my eight-plus years of living in the area. There’s definitely more of a buzz around the Suns with top overall draft pick Deandre Ayton here, healthy and getting set for the season. Add to that a number of rookies with promise, the face of the franchise Devin Booker (once his hand is healed) and a young core and yes, Suns games might be more interesting this season. Ayton dunked, Booker sat with fans in the first row and drew up some plays on the bench and later, the rookies had a dance-off wearing costumes. It’s shaping up to be a rough last few months of 2018 in Phoenix for the local teams. Most accept that the Suns are at least another year away from contending for the playoffs, and Booker isn’t likely to be ready when the season starts. The NFL Cardinals are 0-3. The MLB Diamondbacks had a horrible September and were eliminated from postseason contention a week ago. Our NHL team, the Coyotes, has promise. But how many sports fans here will care? It’s a reality they face annually. A playoff whiteout is a beautiful thing to behold in Glendale, and here’s hoping we get to see it again. Arizona State football will always have a devoted following. But the Devils are 3-2 and it’s hard to tell how successful they will be. But for one day, the Suns drew a nice crowd for a free practice and fans of all ages were able to enjoy it. My kid and I will be there on Opening Night just as we were in 2017.